The GREATEST End-Times SIGN - Revelation 12 | September 23, 2017 ... HERE IS WHY!! Something Epic This Way Comes | Stunning Scriptures Related to September 23, 2017 REVEALED! Stellarium does show the entire constellation which would include all the elements of the sign is only above the horizon in Jerusalem between 11am-4pm. It is a one time event and will never occur again. It did not occur at Christ's birth-the alignment does not match. It is 70 years from 1947 to the rebirth of Israel. It is the 500th anniversary of the Reformation. It is the 70th anniversary of the Dead Sea Scrolls. It is the 120th jubilee from Adam. It is the 70th jubilee since Canaan. It is the 40th jubilee since Christ's death. It lands on the exact same day as Feast of Trumpets - EXACTLY. It is the 70th Jubilee since Exodus (1483 B.C). It marks year 5777 on the Jewish calendar. 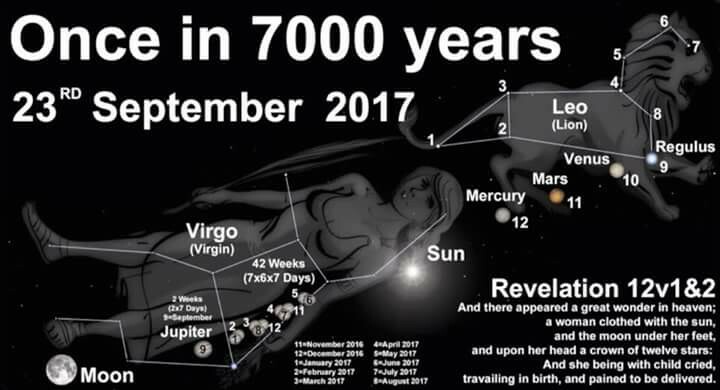 The biblical numeric meaning of 5777 is "grace (5) perfect made complete (777)"
Jupiter is in the Woman's womb the time of a human pregnancy or gestation period. The woman represents Israel, the male child CHRIST AND THE CHURCH, the Body of Christ! The Head having been born first, with the body to follow at the Rapture. The child born is "seized by force" to the throne of God. The word for "caught up" is the same greek word for rapture (Harpazo, to seize by force). The Rapture must occur before the 7 year Tribulation period. It marks the start of the tribulation. The International Day of Peace "just happens" to be September 21, 2017. The Theme "just happens" to be peace and safety. When they say peace and safety destruction suddenly comes.! “I have completed an analysis of the 23 September 2017 Heavenly Sign. I checked seven thousand years and found no comparable event. I checked 6,200 years into the past and 1,200 years into the future which is equivalent to Man's entire History. I began the search by looking at every year from the birth of Christ to 78 AD. I then realized that I only had to check every 12 years in accordance with Jupiter's orbital period. I checked from 78 AD to 3215 AD after which I realized that Jupiter is only in the womb of Virgo for 294 days every 83 years. I then checked from the Birth of Christ to 4248 BC every 83 years checking 12 years either side just in case. The Rabbi’s have taught there will be a total of 120 Jubilee cycles (6000 years) from the time God created the earth until the beginning of the Messianic Kingdom. I think that I may have found a very significant and prophetic link.. Most of you probably know about the second eclipse that takes place 7 years from now that goes right over the one that just took place on the 21st but I believe that there's more significance to these two eclipses than we originally thought. Other than the fact that they're the exact amount of years apart as the Tribilation. When the next total eclipse that takes place in 7 years it crosses right over the totallity line of the one that took place on the 21st. The city that is right dead in the middle of where they cross is called "Little Egypt". Mind you they're 7 years apart..
Jesus Christ is Coming! If you are Not Saved? Do So Now! (Isaiah 55:6) - Seek God While He Man Be Found!! - **Time Is Now! (1 John 1:9) - ** Jesus Died For Your Sins! - All Sin Forgiven! Just Ask? (Romans 10:9) Repent ,Confess, Believe - This is How You're Saved! I am a sinner, and I am Guilty of Sin. I ask for your forgiveness. I believe that you died for my sins on the Cross, was buried, and rose from the dead On the 3rd Day. I will trust and follow you JESUS as my Lord and Savior. Please come in my Heart, Direct My Path and my Life, and Give the Gift of the Holy Spirit, to have Power over the Devil and Demon Spirits. Help me to Live Holy and do your will.. In Jesus name I Pray, Amen. The video that you posted with Mark Biltz has got to be one of the best that I have ever seen!